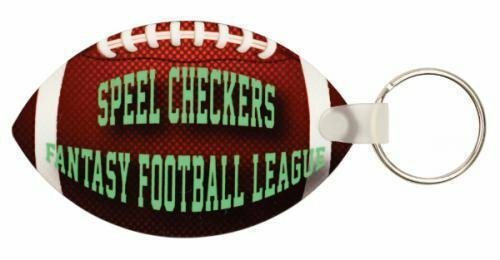 The glossy finish on this football key chain can be personalized in full color edge to edge and on both sides with your team logo or a favorite photo. Made of durable fiber reinforced plastic, this key chain offers great value in a gift or promotional item for your school, team or booster club. The glossy finish on this 1-1/4" x 3" rectangle key chain can be personalized in full color edge to edge and on both sides with your logo or favorite photo. Made of durable fiber reinforced plastic, this key chain offers great value in a gift or promotional item for your organization. The glossy finish on this 2-1/2" diameter round key chain can be personalized in full color edge to edge and on both sides with your logo or favorite photo. Made of durable fiber reinforced plastic, this key chain offers great value in a gift or promotional item for your organization. The glossy finish on this 2-1/4" x 2-1/4" square key chain can be personalized in full color edge to edge and on both sides with your logo or favorite photo. Made of durable fiber reinforced plastic, this key chain offers great value in a gift or promotional item for your organization. Great for gifts, incentives or promotional items, this 1 ¾” x 3” oval key chain has the look and feel of real leather at a fraction of the cost. The personalization with your logo, monogram or other graphics shows in black for beautiful contrast, and top-stitching around the edges provides a finished look. This beautiful, durable key chain includes a 1 3/8” ring and is packaged in a black gift box for presentation. Great for gifts, incentives or promotional items, this 1 ¼” x 2 ¾” rectangle key chain has the look and feel of real leather at a fraction of the cost. The personalization with your logo, monogram or other graphics shows in black for beautiful contrast and top-stitching around the edges provides a finished look. This beautiful, durable key chain includes a 1 3/8” ring and is packaged in a black gift box for presentation. This engraveable keychain is the perfect personalized accessory to keep your keys together. The heart shaped one is great for gifting to loved ones, and the red LED makes the engraving stand out even more. 1 1/4" x 3/4" x 1/2"
This key chain is made of fiberglass reinforced plastic and can be personalized on both sides. Use your full color photo to create a great personalized gift, or your company or organization's logo for a unique promotional item.